Hours 11am - 5pm daily for tastings, sales and platters. 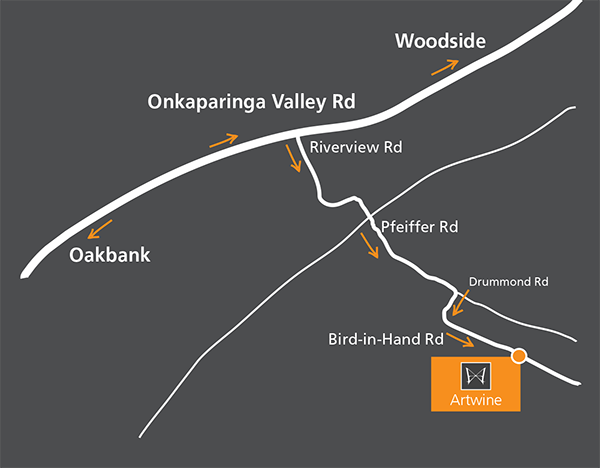 Directions to Artwine - From Adelaide South Eastern Freeway, take the exit to Hahndorf and follow the signs to Woodside along the Onkaparinga Valley Tourist Drive until Riverview Road. Turn right into Riverview Rd (it becomes Pfeiffer Rd) as it bends around and crosses the Nairne-Woodside Rd, turn right into Drummond Road then bear left into Bird in Hand Road. The entrance to ArtWine is 700 metres on your right. 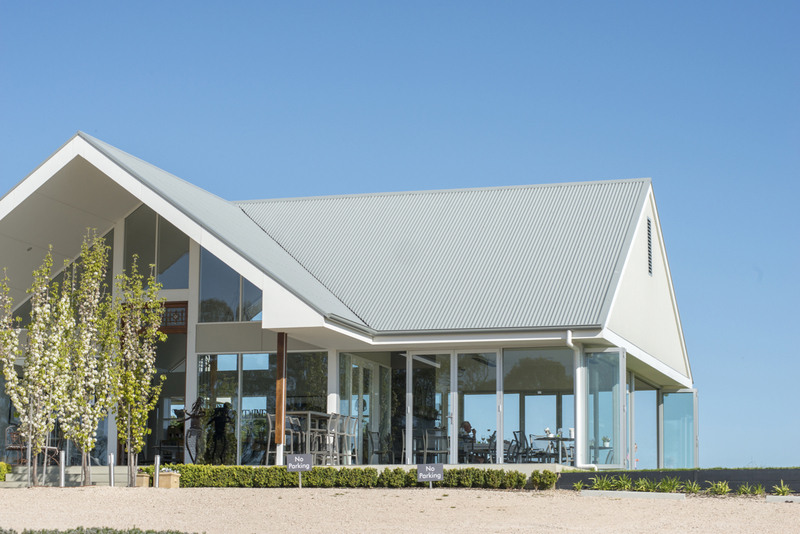 Our architecturally designed Cellar Door (with wheelchair accessability) has a fully enclosed terrace with captivating views that can be enjoyed all year round. We offer one of the largest ranges of Estate Grown new modern (alternative) wine varieties and traditionals available. We have 15 different varieties that are crafted into 19 wines. Tastings of a selection of current vintages are offered daily. We charge a tasting fee of $5 per person. For Groups please see Group Tastings. We offer a range of local produce platters and smaller plates to complement our wines. Stay a little longer, enjoy the comforts of the terrace or take a picnic rug and breathe in the fresh Adelaide Hills air while indulging on the very best the Hills has to offer. We cater to small groups of up to 12 people who are looking for a personalized tasting experience. Tastings are charged at $5 per person for small groups up to 8 people. For groups of 8-12 people we offer a wine flight paired with local cheese and accompaniments in a comfortable seated setting at $15 per person, bookings essential. All group bookings are to be paid in full on confirmation of final numbers no less than 24 hours prior. Sat, Sun & Public Holidays: 11am or 11.30am bookings only. We do not accept licensed buses, 18th or 21st birthday celebrations and Hen’s or Buck’s parties. Our premises are licensed and we serve food, therefore it is prohibited by SA state law to bring any food or drinks of any description on to the property. A selection of local produce platters and small plates are available at Cellar Door from 11am – 4pm daily. These may be restricted on Public Holidays or when private functions are being held. Bookings are recommended. Please call us at cellar door on 08 8389 9399 and chat to us about how we can offer a tailored experience for your next corporate function. Alternatively email us at cellardoor@artwine.com.au with your requests.